EXPRESS YOUR TRUE IDENTITY BY DRESSING UP IN SOUND! Chicago artist Nick Cave says he has always been fascinated with items cast off by other people. The Missouri native and his team assemble thrift-store finds into life-size creations that are part sculpture, part costume, which he calls "Soundsuits." When you see one, Cave wants you to wonder, "What am I encountering?" Costume, sculpture, and performance - this is what he envisions with his Soundsuits. Fully concealing the body, the “Soundsuits” serve as an alien second skin that obscures race, gender, and class, allowing viewers to look without bias towards the wearer’s identity. This workshop is loosely based on his work. The idea is to communicate your individuality through costume and sound. Get out your wild dancin' shoes because we will put on a short fashion show/performance at the celebration dinner on Saturday night! The goal is to stretch our imaginations to create something new and different from our usual work! Things to consider: What best represents your fabulous unique self? The 'suit' can cover your whole body or not. Maybe it's a mask, a hat, a vest? If masks aren't your thing - maybe makeup? To go full body - purchase a painters suit (Home Depot), one has a hood, the other does not. See above photo. Alternatively you could use an old garment as your starting point. Will you be painting your 'suit'? Adding glittery sequins? Gluing gems? Following in Cave's footsteps, your suit could make some sort of noise, soft or loud, it's up to you. Embellishing your 'Soundsuit': This is where it really gets wild! Think popsicle sticks, plastic straws, bells, bottle caps, tin cans, fabric strips, twigs, soda cans, beads, fake flowers, beans, metal washers, crepe paper, etc. (The mind boggles.) Cave uses cast off items from garage sales, thrift stores, etc. Again, what best represents you? We have two days to work, but you can do prep at home. A few years ago, I did this project with my middle school art students and it was an incredible experience. I hope you will join me for a what is sure to be a wild ride. 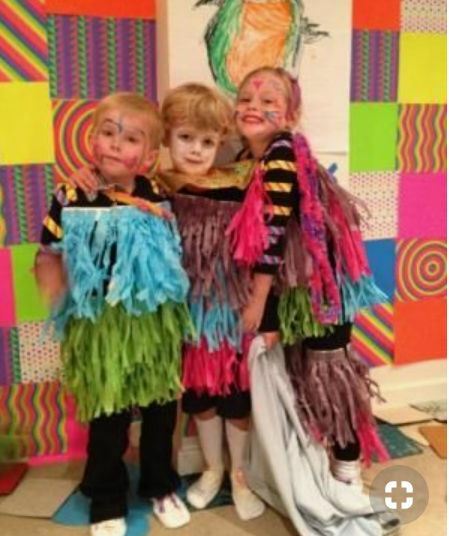 Here is a link to an adorable kindergarten Nick Cave sound suit production video. Check out some of their moves. Nick Cave was born in Fulton, Missouri in 1959. He creates “Soundsuits”—surreally majestic objects blending fashion and sculpture—that originated as metaphorical suits of armor to confront his identity as a black man and how the suits fuel his impulse to create. They have evolved into vehicles for empowerment. Fully concealing the body, the “Soundsuits” serve as an alien second skin that obscures race, gender, and class, allowing viewers to look without bias towards the wearer’s identity. Cave regularly performs in the sculptures himself, dancing either before the public or for the camera, activating their full potential as costume, musical instrument, and living icon. Base for your suit: Painters coveralls, old dress/shirt/pants, muslin fabric tunic, or anything else you can think of. Paint for your outfit if desired. Attaching mechanisms: glue gun, needle/thread, safety pins, stapler, glue, etc.